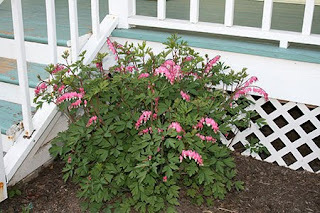 Although, I DID spend some time on the porch reading a magazine and enjoying the soft breeze on Saturday. I've set up a little charming nook on our side porch gazebo with wicker furniture and it's quite cozy. No new jewelry designs created this past weekend, but the ideas are flowing. I've also received all my bead orders with the components I want to use in the Summer Jewelry Collection, but that's for later. It's still Spring and a beautiful one at that! The Crystal Allure Spring Jewelry Collection are pieces that reflect soft feminine hues inspired by beautiful flowers, gardens and butterflies. Infused with a combination of both tranquil and vibrant airy tones in beautiful Pantone inspired shades of Violet (purple), Aurora (yellow) and Dried Herb (green). All our pieces will definately carry over into summer, but there are less than 8 days left to take advantage of the grand re-opening discount of 20%. And many pieces are one of a kind, so don't delay -once they're gone, they're gone for good. The "Fresh Cut Grass" can be seen by following this link: Jade Creation Peridot Mother of Pearl Gemstone Beaded Necklace (NB086). 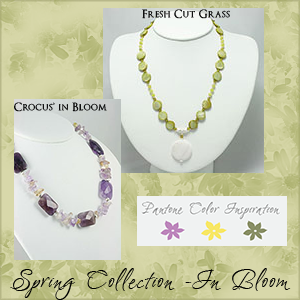 The purple gemstone necklace is the "Crocus' in Bloom" designed with a Spring mix of both purple amethyst gemstone and citrine gemstones. This handmade beaded necklace is just bursting like Spring crocuses with beautiful yellow and purple color. Designed with faceted rectangle amethyst gemstones, a spring mix of amethyst and citrine gemstone chips (Ametrine) and accented with sterling silver beads. Necklace is adjustable 17" to 18-3/4" with a sterling silver circle chain necklace extender. A few months back, I started working with Maria from Galleria di Luce (Bella Business Branding). 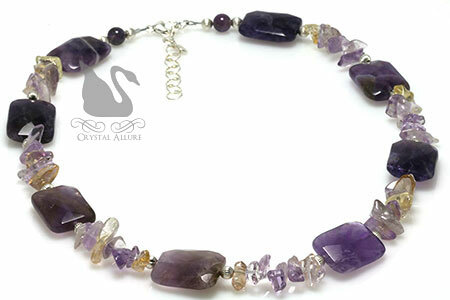 I had contacted her to help re-design / re-brand my online jewelry boutique, Crystal Allure. Prior to finding her site, I had done the typical searches to try and find that unique designer who would help bring Crystal Allure to life on the web. And as always, I kept coming across template designers who were producing, simply put, cookie-cutter templates. Color changes here, font changes there, but in the end it was the same template. What's more, you could never customize it to suit your business -to make your business stand out amongst the rest. And for those of you out there that are jewelry designers...you KNOW you need to have your brand stand-out or else you just fall into the black hole of the competitive business of jewelry design. But Galleria di Luce was different. Galleria di Luce offered an identity as oppose to just a boutique template. Finding Maria was like finding a hidden treasure -it was perfect! I wanted something unique -unique to my business -my own brand. I wanted to embrace that uniqueness that is infused into each of my jewelry designs and express that into my brand. That uniqueness began as a simple swan logo -the symbol of quality Crystal Jewelry. Maria saw my vision and today so many elements are now tied in, from the swan to Swarovski Crystals, the elegant colors used, the sophisticated layout and more. If there is any designer I would absolutely put full-on, unrestricted trust, faith and respect into -it would be Maria from Galleria di Luce. Maria has done so much more than just re-brand Crystal Allure Jewelry, I couldn't even begin to start a list. Maria is just fabulous!!! And her template designs are unforgettable! Through her hard work, patience and understanding, we got through the design phases and she produced a spot-on re-brand for Crystal Allure Jewelry. Every aspect, every element now speaks of the jewelry I produce and the quality of my jewelry. Quality designs that are Beautiful, Feminine, Alluring. Crystal Allure -Redefine Your Femininity! To Maria -thank you, thank you, thank you for everything you did for Crystal Allure Jewelry. I think the site is absolutely beautiful and is the perfect representation of my jewelry designs. Check out Galleria di Luce for elegant business and boutique branding and when you do tell Maria I said "HI". New to Crystal Allure is the one of a kind Secret Garden Swarovski Pearl Charm Bracelet (B175) featuring a lovely strand of perfect white Swarovski Pearls are accented with aurora borealis (AB) Swarovski Crystals and sterling silver rose spacers. Adding to the charm of this handmade beaded bracelet are a green Czech pressed glass leaf charm and a beautiful orchid quartz gemstone teardrop briolette charm. Finished with a sterling silver heart toggle clasp and signature jewelry tag. Measures 7-3/4". 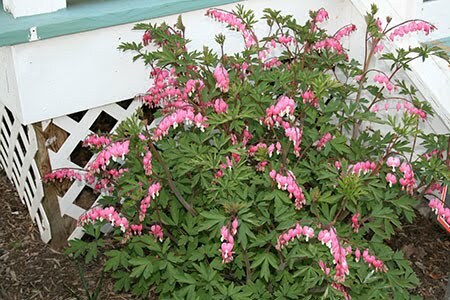 I only have to look to my own gardens for inspiration. Enjoy below some fab pictures taken of my bleeding heart bush in April 2010. We were only weeks into spring and these bushes, one each of the sides of our steps leading to our front door, were just sprouting faster than I could enjoy them. So I snapped some photos to show how beautiful they are and in return for admiring my beautiful garden I was inspired to create a secret garden bracelet! Enjoy! 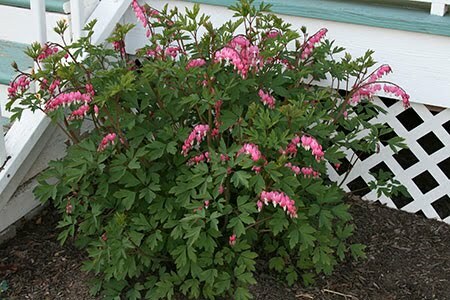 My bleeding heart bushes love the spot they are in and have since taken over half of the steps leading to our front door. 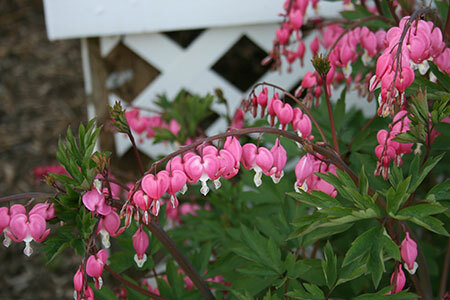 They don't have as many blooms anymore, but they are still as beautiful as they were in these pictures. Why Buy When You Can Borrow Jewelry? While doing some researching I came across the website for Adorn. The business concept is that you can rent fine diamond jewelry (yes, genuine diamond jewelry) for your wedding or special occasion. You simply shop for jewlery you love, add them to your bag, checkout with your credit card, wear your amazing jewelry and then simply send it back via UPS (using the pre-paid label they provide you). How much easier can it get?! Not sure what style jewelry to complement your gown? Take advantage of their style consultation services for worry free advice on the best jewelry for your outfit. Another added benefit of renting dazzling genuine diamond jewelry....it's green. I hope everyone had a FABULOUS mother's day, and a belated Happy Mother's Day to all you moms out there! Mothers day might be behind us, but it's never too late to update your style. In fact, the most popular times to update ones style is during the season changes. 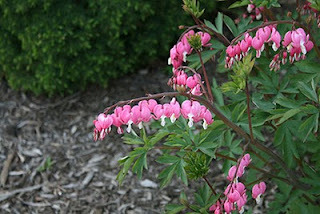 We're still in spring but closing in on summer -fast! An article by Bobbie Thomas, TODAY style editor, suggested adding a bit of Feminine Flair to your outfit (which is what Crystal Allure is all about!). This is the perfect option for the lady who can't stand the idea of putting on a skirt, but still wants to feel feminine. The easiest way to to do is with a notice-me-now necklace. 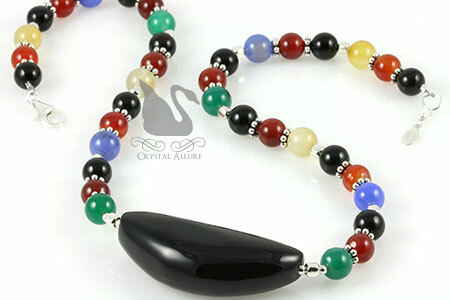 If you love to wear black, try this festive black Onyx Indian Agate Gemstone Beaded Necklace (N092). It's a bold style that will add a burst of festive color to moms wardrobe. The unique "watermelon slice" shaped black onyx pendant is the focal of this stunning beaded necklace and because it is handmade, it makes the necklace even more special. With the various colors of Indian Agate gemstone it offers a variety of opportunities to coordinate with outfits. Looking for a lighter style that still offers that same notice-me-now look but with a little shimmer? 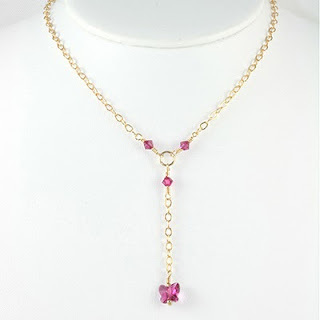 Slip on the Sandy Beaches Golden Pink Crystal Necklace (N017) in delicate colors of pink and pale gold that mimic the sparkling crystals on sun-drenched beaches. A 14 karat gold fill circle link chain allows for a front closing clasp in this beautiful Y style necklace. Haven't quite found that you piece of jewelry at Crystal Allure? Contact me to have a custom design created, just for you! The art of electroforming a real leaf is a delicate process. First, a real leaf is pressed flat and dried. 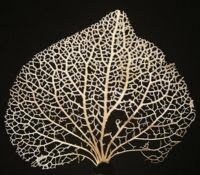 Once it has dried, the leaf’s pulp is removed in a light acid bath which produces the result of a leaf "skeleton". This skeleton is very fragile as it only has the veins of the leaf holding it together. The leaf is then dried once more and then hand painted with a copper based paint (which allows it to be electroformed). The leaf is next submerged in an electrolytic solution and with the magic of the positive/negative charges from electricity, metal deposits onto the copper based surface. This process takes place over a period of three days. Logically so, if the leaf has fine veining then a "filigree" leaf will result; if a leaf has little veining then the electroformed surface will be solid. Tip: Prolonged electroforming will also result in a more solid form. Taking the extra time during the electroforming process insures the metal deposits are uniform. The final metallic leaf finish is dependent on the electrolytic solution used. 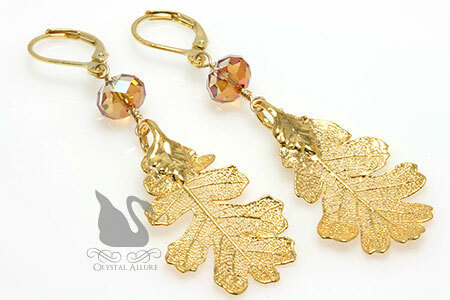 The leaf jewelry Crystal Allure offers have been electroformed in 24kt gold but other variations exist that include sterling silver or iridescent rose gold (which is a combination of 24kt and copper). Leaves should be cleaned carefully with a warm cloth and not with abrasives to maintain its longevity. Each leaf is unique and special, capturing a part of nature, resulting in a beautiful piece of wearable art. Over a period of time, our 14kt gold electroformed leaf jewelry will age to a deep brown-red. If you wish to use this article on your website, you may do so, with a source reference at the end of the article (as shown below) and a link back to our website. Thank you. So, it's summer...and the days are longer (right? )...and yet, there just is never enough time in the day to do what one has to do! The last few months have been extremely busy and I am still in the middle of getting all facets of the grand re-opening in place at Crystal Allure. Soooo, because of this delay and that I have been unable to focus immediately on incoming orders (my apologies to those who have had to wait), I'm extending the 20% storewide grand re-opening discount until May 31, 2010!! To take advantage of this fab offer, just enter grandopen2010 in the coupon box at checkout.